This week, I’m trying something new! I’m participating in a link ups over at Mrs. Disciple and Empty Plate. Full Heart! Kelly and Andrea host these link ups every Friday, with their Friday Fives. 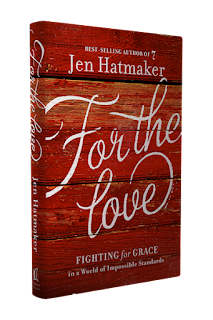 This week’s “Five” are quotes from Jen Hatmaker’s new book, For theLove. There are TONS of thoughtful, poignant, funny, and wise quotes from the book, so I really had my work cut out for me in only choosing five. Click on the image to print! As a mom who’s raising future adults, this was especially meaningful. I want this for my children. If my kids couldn’t write their own name but loved Jesus and others, I would be just as proud as I am of their straight-A’s. I really, really would. This has become something of a mantra for me, personally. It will probably be found on my actual body in tattoo form one day. I love this truth! We take Jesus wherever we go! Not every gesture must be grand—we can do small things to show God’s ridiculously lavish love to people we encounter on a daily basis. These words opened my eyes to see that as Christ followers, our very lives are a ministry. Everyone who meets us, or reads our words on Facebook, Twitter, etc., meets Jesus too. This year has been the year of extra chub, gray hair, and, well, just not feeling great about getting older. Jen’s perspective on aging was hilarious and full of wisdom. The girls in their twenties can have their bikinis and low-calorie meals. I’ve reached Tankini Age, and all my business fits in my bathing suit, thankyouverymuch! 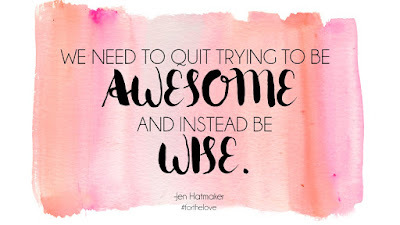 It’s nice to be awesome, isn’t it? But being awesome is really exhausting. So, remembering to make wise choices regarding how I spend my time is really important. Because you can’t be awesome if you’re face down on the floor in a puddle of drool. 5. Balance. It’s like a unicorn; we’ve heard about it, everyone talks about it and makes airbrushed T-shirts celebrating it, it seems super rad, but we haven’t actually seen one. I’m beginning to think it isn’t a thing. Can we please lay the Balance Monster to rest? PLEASE?! Finding balance has nothing to do with how much you can do before you collapse, but instead figuring out what you can get rid of in order to keep yourself from being institutionalized. So there they are—my Friday Five! Don’t forget to preorder your own copy of For the Love here or here! It’s also on shelves in some Barnes & Noble stores! I like #3 a lot! Great wisdom I am learning as I get older :-) Here are mine. I Love this and your blog is BEAUTIFUL! 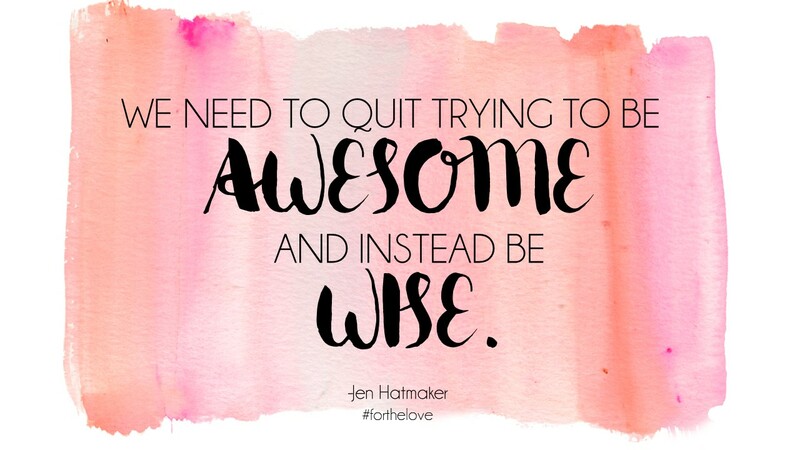 Love the quotes you shared and the graphics! Also, great idea to use the embedded videos! Here are mine: http://kellyjohnsongracenotes.com/2015/08/14/friday-five-ftl-quotes/ Feel free to come post your link on mine!! 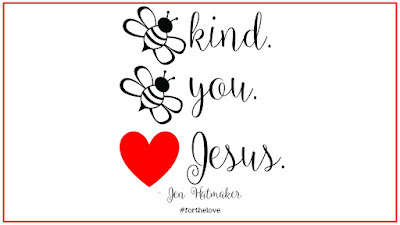 I love the bee graphic! I want to do that in my kids' rooms!! Thanks for joining in the #FridayFive fun!